Have you ever made a program perform a task, and then realized that the task was taking way to long and you would rather cancel it, but the program is too busy to respond to your request? Or maybe you where working along with an application, and suddenly it slowed to a crawl, and now you want to cancel it. Here are three ways to force a program to close. 1. Press [Alt][F4] to force close the active window. 2. Right-click on the Windows Icon (Start button) to open the Super User menu. In the Super User menu selct Task Manager. 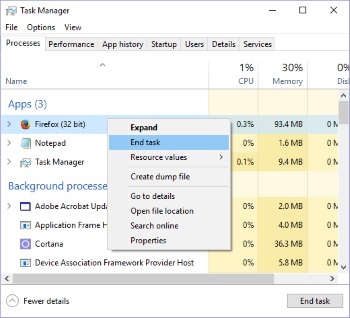 In Task Manager Processes tab, Right-click on the name of the program you want to close, and in the popup menu that appears, select End task. After pressing [Enter] to execute the command, type exit and press [Enter] to close the command prompt.